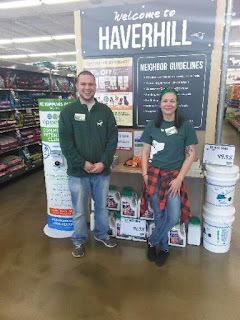 I got a call from a neighbor who wanted to tell us about something she witnessed at our Haverhill, Massachusetts store. She said there was another neighbor, Kate, who had lost her keys in the store. Team members Danielle and Tyler were wonderful. They got the neighbor a chair to sit in, as well as a glass of water, and then set off to look for her keys. It took almost forty-five minutes but the two of them found Kate's keys for her! Our neighbor said they went above and beyond regular customer service to help this person and she wanted to be sure we knew about it. Danielle and Tyler, what PAW-some neighbor service skills you have! Keep up the great work!